I have lost my Capture One License Code or Product Key. How can I find that Key again? Method 1: If you have purchased your key from a Phase One Dealer or external website, and have not yet activated the software, Contact them and ask them for the license key. 1. Login to your Phase One Profile at www.phaseone.com. Click on "Login"
2: Login with your email address (associated with your Phase One account) and password. 3: Scroll down to "Software License"
4: Product keys are listed here. click on one to see the full information. 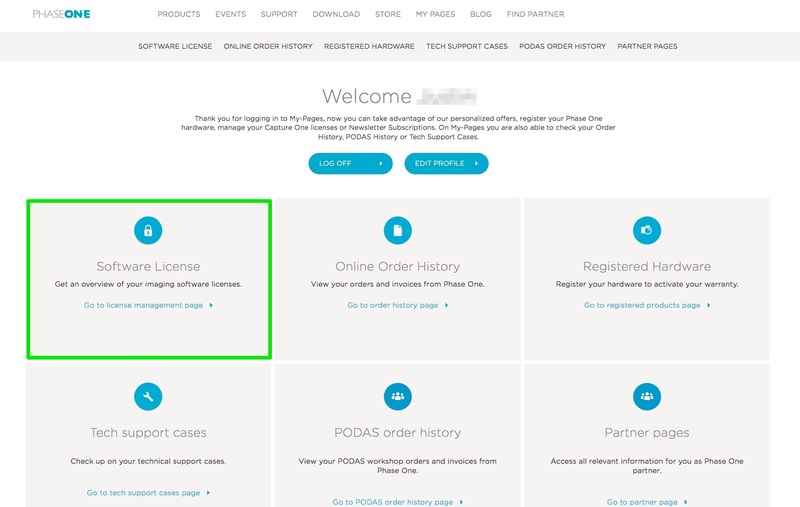 If you purchased a license but have not activated it, click on Order History. After clicking on the key you can now see all 16 characters of your license code. Important information about your key will be displayed, the original version of your key, as well as how many upgrades are available and how many free activations you have left. 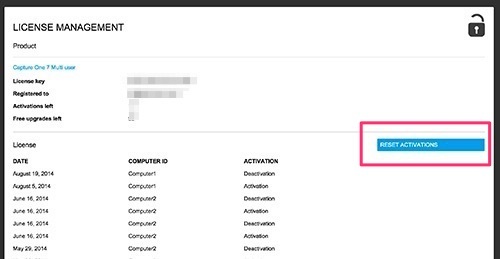 You can also view your activation history and reset all activations to activate on new computers. Free Upgrades = Upgrades allow you to activate the next major release of Capture One. In otherwords a Capture One 7 license with 1 free upgrade would also allow you to activate Capture One 8. Free upgrades usually appear on licenses that were purchased just before the a major version release to allow for a purchase grace periord. Upgrades should not be confused with UPDATES which are always free. An update is a minor version release, such as going from Capture One 8.1 to Captue One 8.2. Your license is valid for all releases that begin with the same number. Major version Upgrades, such as Capture One 7.x to Capture One 8.x are paird upgrades. Backwards compatibility= Capture One licenses can be used for all previous versions as well. For instance a Capture One 8 license can also be used to activate Capture One 7. The exception to this rule is Subscription keys which are only valid for Capture One 8.0 and newer. They cannot work in Capture One 7 becuase 7 does not understand subscription management.